What does secular stagnation mean? Larry Summers (2013) was the first to suggest that current slow growth rates might reflect a longer-term trend, reminiscent of the ‘secular stagnation’ fears of the 1930s . A lively academic debate followed, recently covered in Teuling and Baldwin (2014) and Eichengreen (2014), which identified two main sources of secular stagnation: demand side issues, such as weak demand – and Summers’ original hypothesis – and supply-side explanations, the main focus of this post, according to which the gap between actual GDP and its potential is currently quite narrow, and the slow growth we observe is more a problem of slow potential growth than of weak demand. The main proponents of this explanation are Tyler Cowen (2011) in his recent book, The Great Stagnation, and Bob Gordon (2012, 2014). Gordon’s 2012 paper attracted interest mostly for its prediction of a slowdown in technological progress, thus in his more recent article (2014) he emphasises that technological progress is only one of the aspects of the problem, and that other structural headwinds (demographics, education, inequality, and government debt) are likely to detract from US economic growth in the next few decades. Rapid technological progress, coupled with booming population growth, has been the force behind the strong and sustained economic growth in the last two centuries. In particular, innovation has often been associated with the introduction of a completely new and transforming technology – a so-called ‘General Purpose Technology’ (GPT), such as the steam engine, electrification and the ICT. Will the current GPT – digital technology – drive growth at the same pace as the other two? The ‘supply-side’ secular stagnation hypothesis is that it will not, and revolves around four main arguments. The first argument is centred on the scale of existing innovation. According to Cowen (2011) and Gordon (2012), the ICT revolution does not have the same power to drive growth as the technologies that occurred in the past. Craft (2004) however, found that the impact of the ICT on labour productivity has already been greater than that of steam, due to the sharp decline in the relative price of ICT compared with other goods. The second argument is based on the impact of existing innovations. 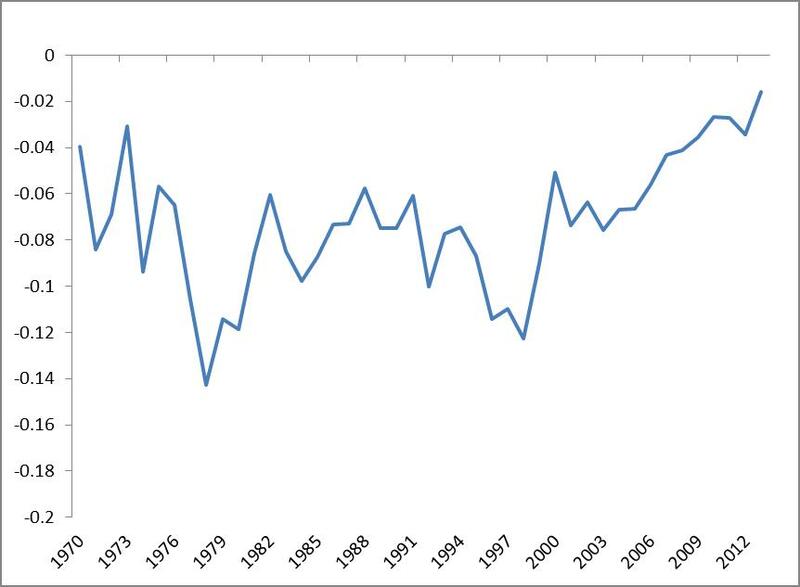 Gordon (2012), for example, argues that the ICT revolution has mostly run its course, having peaked in the late 1990s. By contrast, Brynjolfsson and McAfee (2011) argue that the ICT revolution will take decades to play out fully. Instead of a ‘Great Stagnation’, they see the current environment as the start of a ‘Great Restructuring’: digital technology, like all GPTs, requires parallel innovation in business models and organisational processes and new institutions and skills before its full benefits can be reaped. The third area of disagreement is over future sources of innovation. Gordon (2012) argues that no great inventions are on the horizon. Economic historians such as Mokyr (2014a, 2014b) postulate instead that the productive potential of some emerging technologies (such as robotics and the human genome) have only begun to emerge and that digital, biotech, and new materials are going to revolutionise the economy. The fourth argument is centred on the role of ideas in innovation. Jones and Romer (2010) note that demographic expansions lead to more ideas, which make it possible for the world to grow and support a larger population, in a feedback loop that generates accelerating growth rates. By contrast, Gordon (2014) highlights the unfavourable demographic landscape: world population will peak in this century and then decline, further contributing to the slowdown of innovation. Many forces, however, could offset these trends: for example, the growing number of people living in cities and improvements in trade and communication links could make it easier to share ideas with a large number of people, and, as Mokyr points out, the new digital technologies are driving acceleration in the efficiency of research. What are the current and likely future trends in the technology sector? As identified by Baily et al (2013), there are a number of emerging technologies that provide tremendous scope for improvements in productivity. Industrial robotics, for example, has the potential to fundamentally change manufacturing by increasing precision and productivity without incurring higher costs. 3D printing could generate a new ecosystem of companies providing printable designs on the web, making everyday products endlessly customizable. The so-called ‘Internet of Things’ offers the possibility to connect machines and equipment to each other and to common networks, allowing for manufacturing facilities to be fully monitored and operated remotely. In health care and life sciences, data driven decision-making, which allows the collection and analysis of large datasets, is already changing R&D, clinical care, forecasting and marketing. The use of big data in health care has led to highly personalized treatments and medi­cines. The infrastructure sector, which had no gain in labour productivity in the last 20 years, could be greatly enhanced by, for example: the creation of Intelligent Transportation Systems, which could massively increase asset utilization; the introduction of smart grids, which could help save on power infrastructure costs and reduce the likelihood of costly outages; and efficient demand management, which could dramatically lower per-capita energy use. Which of these emerging technologies have the greatest potential to drive improvements in productivity? For the McKinsey Global Institute (MGI) (2013) ‘technologies that matter’ are technologies that have the greatest potential to deliver substantial economic impact and disruption in the next decade. Those that make their list are rapidly advancing (e.g. gene-sequencing technology); have a broad reach (e.g. mobile internet); have the potential to create a massive economic impact (e.g. advanced robotics) and have the potential to dramatically change the status quo (e.g. energy storage technology). MGI estimates that the economic impact of these technologies – derived from falls in their prices and their diffusion and improved efficiency – to be between $14 and $33 trillion per year in 2025, led by mobile internet, the automation of knowledge work, the internet of things and cloud technology. Is there any evidence that innovation is faltering? While the prospects for technological progress and economic growth are inherently uncertain, we see a more optimistic picture than that depicted in some of the academic papers. Indeed, many economists agree that the digital revolution is as – if not more – important than the previous industrial revolutions and that it has still far to go in terms of impact on productivity. The risk is not, as some economists postulate, that innovation has stopped. Instead, we see as main risk to future growth the inability to exploit future opportunities by failing to invest in new technologies today, as well as in the new skills required in the future. A really novel argument in the debate is Mokyr’s description of the acceleration of the scientific process and the potentially exponential benefits of the digitalization of R&D – if this is a realistic prospect, the opportunity cost of not investing in new technologies and skills becomes even larger. 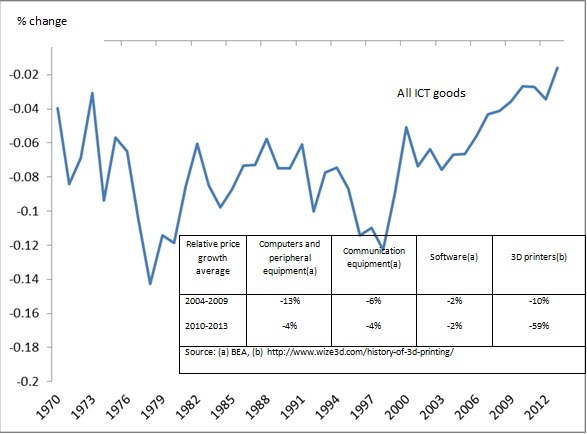 The strongest evidence presented against innovation is the slowdown in the relative price of traditional ICT goods (computer and peripherals, communication equipment and software) as depicted in the chart. The second wave of the digital revolution, however, is going to be driven by the diffusion of more recent inventions such as advanced robots, 3D printers and new materials. As the table shows, the price of 3D printers has fallen dramatically in the past few years. According to a survey reported in the Harvard Business Review, for example, 11% of US manufacturing companies had already switched to volume production of 3-D-printed parts or products in 2014, and a technology is considered ‘mainstream’ when it reaches an adoption level of 20%. If we believe that current and likely future technologies have the scope to drive productivity and economic growth, Gordon’s concerns about the potential for increased income inequality should probably be taken seriously: as discussed in MGI’s paper, it is possible that the adoption of new technologies will have distributional impacts, both within individual economies and between them. High-skilled workers and innovators could see new sources of employment, while low-skilled workers could see their jobs replaced with machines. Jobs could be repatriated back to advanced economies if advanced robotics meant that they could compete on price with low-cost producers in the developing world. But the developing world could also benefit disproportionately from the adoption of new technologies. For example, while improved energy storage technology could make electric cars more competitive in the advanced economies, they could facilitate access to electricity in developing countries, leading to a much higher impact. Note: The blue line is the weighted price growth average of computer and peripheral equipment, communication equipment and software. Authors: Saara Tuuli works in the Bank’s Inflation Report and Agency Intelligence Division and Sandra Batten works in the Bank’s Structural Economic Analysis Division.